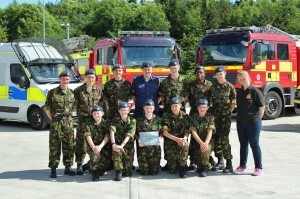 Cadets from 234 (City of Durham) Air Cadets have completed the Duke of Cornwall’s Community Safety Award. This award involved the cadets learning how to cope in an emergency, such as if their area floods or there is a fire, as well as learning about medical emergencies. Those who successfully completed the award were all invited to a Fun Day at Bowburn Fire Training Centre to celebrate their achievement. 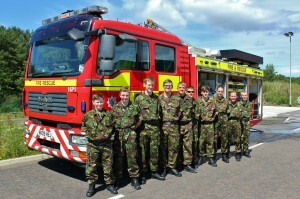 The day involved a flood scenario where the cadets worked alongside the emergency services solving the situation. Hence, the cadets had fun building roadblocks, using the fire hose and finding out about how the ambulances approach a flooding situation.